How do LEDs product light? How do LEDs work? What is an LED? 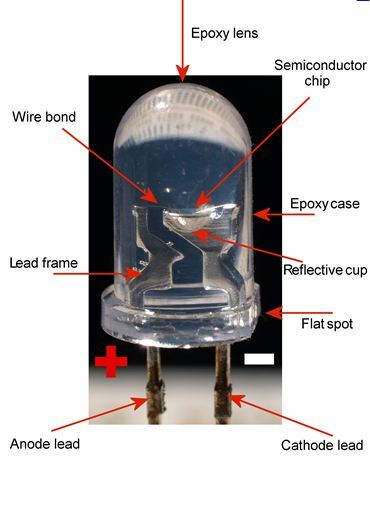 How does an LED light work? How do LEDs produce light? LEDs at their basic level are a lattice work of Si (silicon). The nature of this atom when combined with other Si atoms is to form a network of non-charged bonds between themselves. This non-charged state makes pure Si non-conductive meaning it will not carry an electrical current. Scientists have found a way to allow just a little amount of energy to pass through the lattice work of Si by replacing a minimal amount of Si with other materials and arranging them in a way that the energy flow is controlled. A diode, as in LED (Light emitting Diode), is a combination of different materials that does this and as a result light is emitted. As electricity passes through these materials the electrons in the compound become excited and emit photons of light. The materials used in the lattice work can control the different colors and intensities of the light emitted.